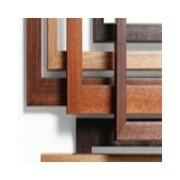 MATcutter.com has a wide array of unassembled picture frames. This option includes everything you need...frame, Choice of Standard, acid-free and lignin-free Tru-White™ core or White Archival Cotton mat, backing with hardware attached and acrylic glazing. You can easily load your image from the back of the frame and you are ready to hang. No muss, no fuss, no glues. You will need some Framers Tape for attaching your image. Clck on the image to select frame sizes and colors. A complete frame kit for the artist Black wood frame, choice of Archival Cotton mat or our Standard, acid-free and lignin-free, White White on Tru-White™ core mat, acrylic glazing, thick backing with hanging hardware already attached. The wood frames with black veneer offers the dominant picture frame color in gallery and show exhibits as well as home decor. We now offer a variety of styles in black veneer mouldings. Basic black rules! Each kit includes an assembled picture frame, .060 acrylic glazing, choice of White Archival Cotton mat or our Standard, acid-free and lignin-free, White White on Tru-White™ core mat and a back with hangers attached. Moulding has a wonderful grainy texture and variegated color. This veneer picture frame gives you the timeless look of real wood without the cost of solid wood mouldings. A great combination of traditional wood texture with modern, green manufacturing! Available in Cherry, Coffee Brown, Natural and Walnut. 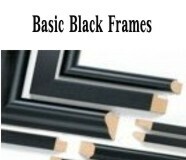 Frames hang vertically (portrait) or horizontally (landscape). Picture Frame Kits in Black. Durable black wrap over MDF moulding. MDF is a wood product made from finely ground wood that is put under great pressure and heat to form an extremely smooth base. It is the most cost efficient of our wood lines. Made in the USA! Frame Kit includes assembled picture frame, crystal clear acrylic glazing, choice of White Archival Cotton or our Standard, acid-free and-lignin free, White White on Tru-White™core mat and a back with hangers attached. Select to see more about the complete picture frame kits and a listing of your size choices.